The 3s: Learning can be a messy business. Our 3s want to do everything. They are builders, painters, engineers and sculptors. They are hands-on, experiential learners, interacting with materials by fully immersing themselves, and often their clothing, in the process. The early childhood classrooms are equipped with basic materials through which the children can express and give form to their ideas. The materials for 3s include (but are not limited to) blocks, paint, water and clay. These open-ended materials can be used in a variety of ways. Each material provides opportunities for experimentation and discovery, and each allows for challenges that address individual children's particular skills and interests. The basic materials also address the diverse sensorial needs of children, from the dependable solidity of blocks to the delightful pliability of clay. The materials can all be used in social as well as solitary ways. Young children find a great deal of delight in experimenting with the properties of the materials, as well as using the materials to express what they know and feel about the world around them. Indoor and Outdoor Blocks: 3s begin the year exploring the different unit blocks and their qualities. They experiment with concepts of balance and weight in their constructions and use the unit blocks to explore patterning and design concepts. 3s begin to intuit the fractional relationship of the unit blocks to each other, inviting children to play with fractional substitutions in their block work. Through use the 3s internalize these concepts and continue to explore the material as they problem solve. Children also use blocks to create a forum for their dramatic play. This is particularly evident with the large outdoor blocks that the children use on the roof. 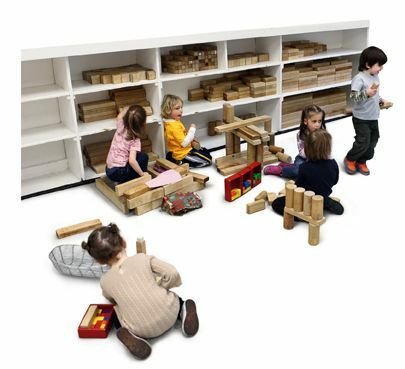 Using the larger, heavier square and rectangular blocks, plus boards and ladders, children construct complex structures in which they may directly participate in their dramatic play. They create their own versions of familiar structures from the world around them, from baby beds to houses and factories, from fire stations to ice cream stores. Dramatic play with the unit and outdoor blocks offers children varied opportunities to test and integrate information they have about the world around them, as well as to share new information with their peers. Paint: Paint is a basic work material, available in the primary colors (red, yellow and blue) as well as black and white (mid-year). The omission of the secondary colors (orange, green and purple) allows the children to experiment and create these colors on their own. The children explore color mixing with and without intention. As they mature, they begin to internalize and verbalize the process by which to create new color shades and hues. The 3s are usually most interested in experimenting with the liquidity of paint, control of the brush and the space of paper. Painting at the easel offers children a place to work independently. Painting affords both physical and emotional outlets for children. Water: Water offers an inviting and familiar experience for young children. The 3s explore and experiment with the properties of water, using the accessories provided. They practice pouring from a variety of containers and funnels. They also engage in dramatic play—washing babies, cooking food, etc. The water table can be a place for social interaction, as well as a place for solo work and making observations. Clay: Clay is available to children during their indoor work time. In contrast to the other basic materials, clay is a malleable material that gives children a tactile sensory experience. Children use their hands to pound, roll, pull, spread and pinch the clay. There are countless ways to explore and experiment with this soothing medium. Clay provides many opportunities for socializing and dramatic play. Children often share stories and techniques for working with the material. They might also pretend to cook, share foods, have “parties” or blast off to the moon. Children often like to chat while they are pounding or pinching the clay. Working with clay helps to develop children’s fine motor skills. As small motor coordination increases, children are able to add finer detail to their work. Music is incorporated throughout the 3s’ school day to aid in transitions. Specific songs with instructional words are used to gather children for pick-up meetings, walking up and down the stairs and during other Group times. In addition, the 3s sing songs as a whole Group daily. A variety of songs are sung: songs to be sung while sitting down, songs that incorporate whole-body movements, songs in different languages and counting songs. 3s thrive on repetition; therefore, several of the songs are sung repeatedly throughout the school year. During the Group time, 3s begin to learn and practice how to take turns and participate by making requests or sharing bits of information with their peers. 3s use their expanding language to communicate throughout the school day. In the daily social interactions of the classroom, children become increasingly aware of the need to express their needs and desires verbally, and to be understood by others. In the process of communicating with others, vocabulary increases and sentences become more complex. An exciting progression of language development occurs as children experience the satisfactions of the give and take of conversations, resolving conflicts and communicating their needs and having them met. The adults in the classroom consistently model the language associated with these exchanges. The 3s program and materials offer multiple opportunities for strengthening and enriching verbal skills as children interact, engage in dramatic play and relate experiences. In addition to being exposed to high quality children's literature of various genres, 3s are also encouraged to respond verbally to the stories teachers read to them. Teachers use genuine questioning techniques to encourage children to think about and to remember the details of these stories. In this way children gain confidence in their language abilities as they begin to describe their reactions to the stories being read to them. Learning about the world in which they live is a major interest of young children. In the 3s, this journey of exploration begins with a focus on children coming to know the City and Country community. 3s take trips in both small and whole groups to other classrooms, the Library, School Store, Post Office and Kitchen.